Though it’s not always easy, many Catholic bishops exemplify this fearlessness by word and by action each and every day of their lives. They live the truth taught by Christ Himself and serve as role models for those of us who often fall short. These bishops demonstrate that there is, indeed, hope for a future filled with the truth of Christ and His will for each of us. There are so many heroic Catholic bishops who speak the truth publicly that it would take thousands of words to share every one of their wise statements. But hopefully the following examples will not only inspire you, but will motivate you to shake any fear you may feel when the sea of your life is churning. We’re in a struggle for souls. Our adversary is the devil. And while Satan is not God’s equal and doomed to final defeat, he can do bitter harm in human affairs. The first Christians knew this. We find their awareness written on nearly every page of the New Testament. The modern world makes it hard to believe in the devil. But it treats Jesus Christ the same way. And that’s the point. Yes, that is the point. Our world has forgotten Christ. It has forgotten mercy, love, and morality, and has replaced these things with hedonism. This is why we desperately need Catholic bishops who will stand in this gap and preach the truth no matter what the culture tells us. Don’t be fooled by those who say they “aren’t pro-abortion, but are just pro-choice.” It’s a smoke screen for what they really believe, but are afraid to admit. After all, what kind of choice are they promoting? They’re not talking about choosing a favorite ice cream flavor, are they? And it’s not about so-called “reproductive freedom or women’s health care” either. Clearly, politicians who support abortion are encouraging a choice that ends the life of an innocent human being and ultimately harms the mother, personally and spiritually! Let the words of these courageous men inspire you to action. There are several things YOU could do in response to their clear teachings. Vow to learn more so that you can follow their example in your families, in the schools your children attend, in the workplace, and everywhere where you have occasion to share the beauty of Catholic teaching. Pray in thanksgiving for each of these heroic bishops and for so many others not mentioned here today. And finally, write letters or e-mails or post gratitude on social media letting these bishops know you appreciate them and strive to learn from their examples. 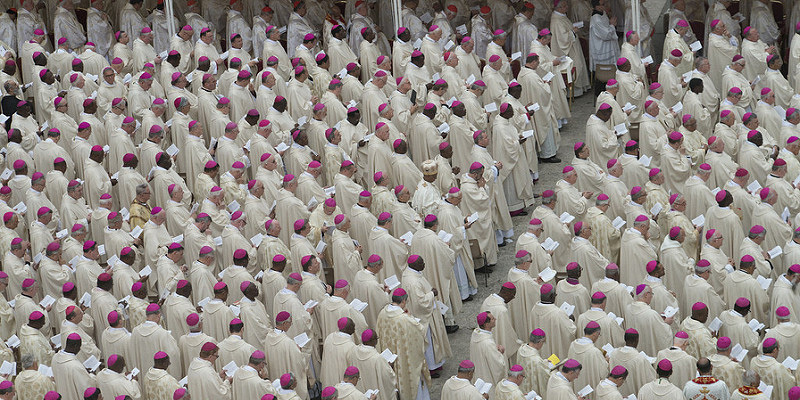 Thank you, Catholic bishops, for your leadership and for your faith. Like you, we vow to have no fear, for we know the eternal love of Christ and that He will always be near.